A dash of beauty and a dollop of heartbreak. 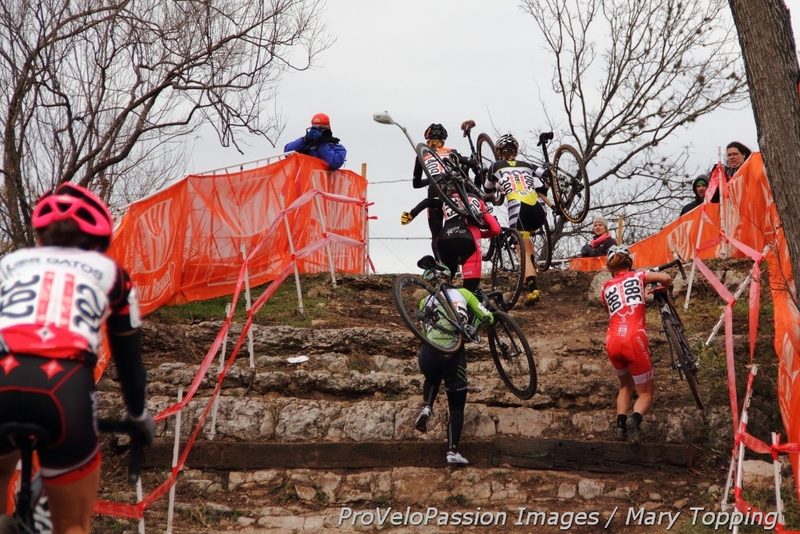 Cyclocross racing does not discriminate. 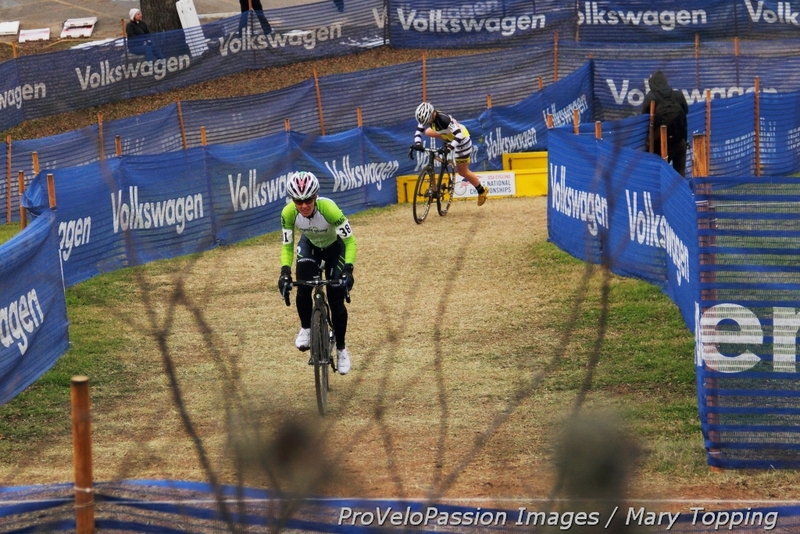 After a dream season last year Kristin Weber (Boulder Cycle Sport) seemed practically destined – or as close as you can get to that promise in cyclocross – to become a national cyclocross champion in her age group. She started the masters 40 to 44 title race in Boulder, Colorado as the state’s best elite amateur woman cyclist based on her winning results in the season-long Colorado Cross Cup competition. Then the vision of raised arms at the finish line, buoyed by roaring cheers from the crowd that included family from Michigan, faded on course at Valmont Bike Park. It wasn’t her day after all. Due to the stress and fatigue of caring for sick children in the days leading into the race and other factors, she finished sixth, just off the podium for the top five. 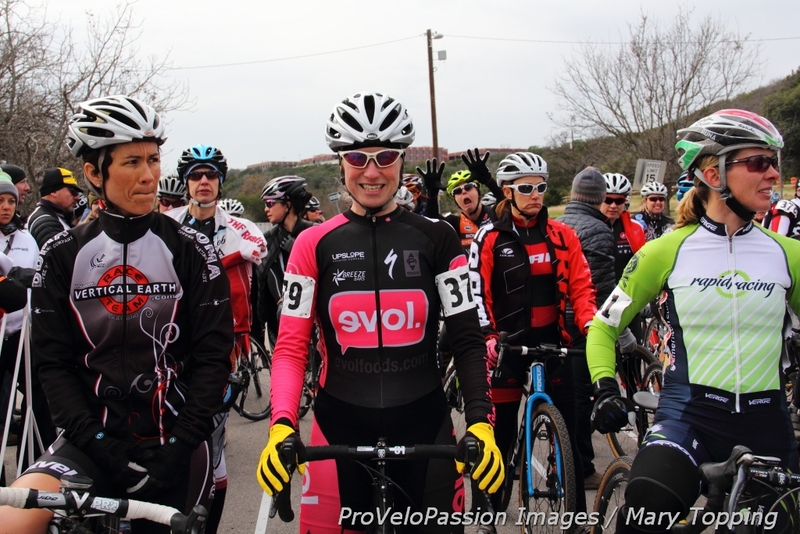 Meanwhile Melissa Barker (Evol Racing) had found her groove in the masters 35 to 39 title race in Boulder. 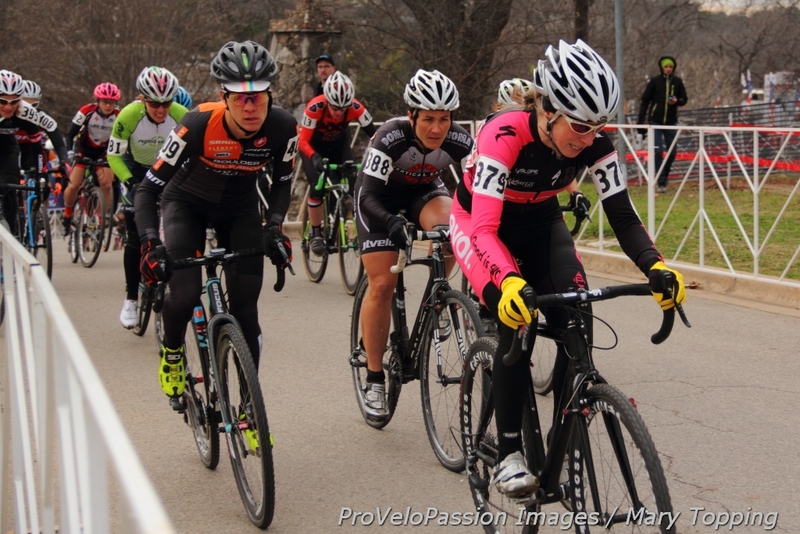 She placed second, a great result in a talented national field after a cyclocross season with nary a win. 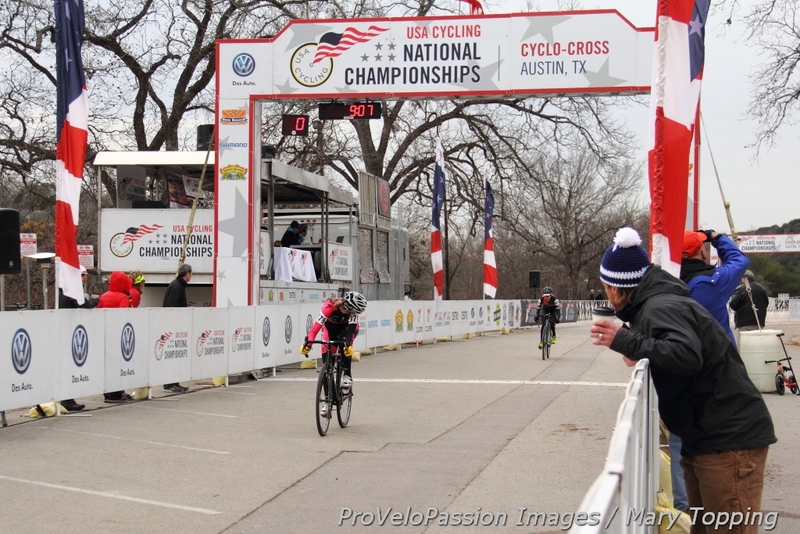 Now one year later in 2015, as these two women straddled their bikes in Austin, Texas on the front row of the starting masters 40 to 44 field that would yield the next national champion, Weber and Barker’s roles had reversed. 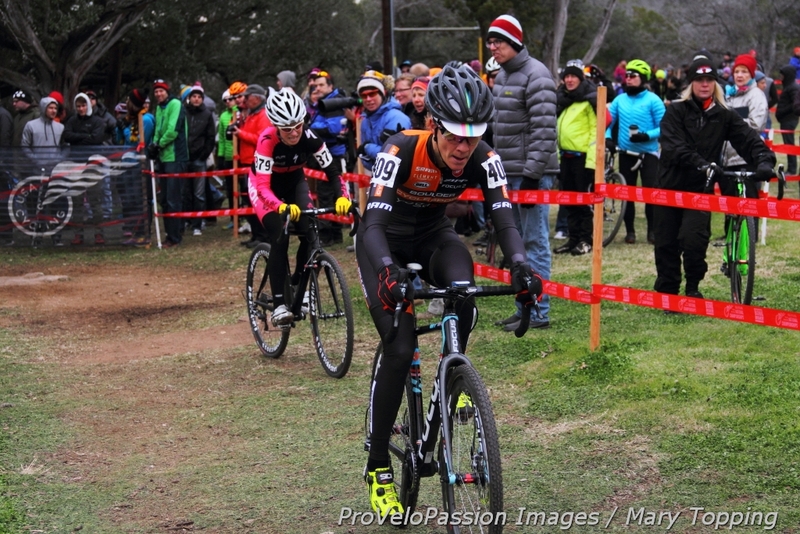 The Boulder Cycle Sport rider’s results had improved as the season wound down, but fell short of last year’s take and Barker’s winning haul which made the Evol rider the new Colorado Cross Cup champion. 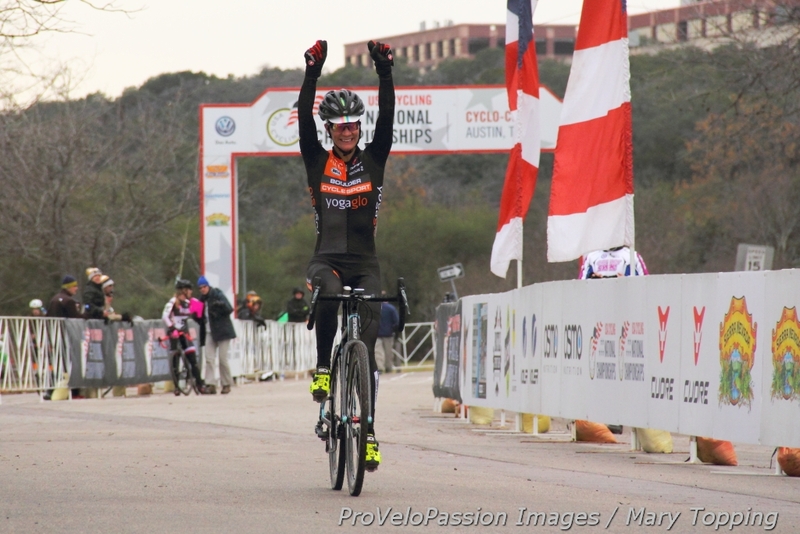 On the start line in Austin, Barker was the new heir apparent of the destined win. She took the hole shot and the two Colorado women quickly outdistanced the field together. Barker led into lap two with Weber trailing by several seconds. In lap three Weber led with Barker on her wheel. Then things fell apart for Barker in laps four and five and Weber gained a twenty second lead. “I was right on Weber’s wheel, feeling pretty good. And then within a couple of minutes all of a sudden my legs kind of exploded. I had trouble even walking, physically getting up the stairs. Then I got back on [the bike] and could hardly move my legs,” Barker later recounted. Ahead of her, one year off schedule, Weber raised her arms skyward at the finish line and became the new national champion in her age group. “I really believe with nationals there is an element of luck. As a parent, my kids were sick last year, and I crashed, and I was on antibiotics. There were a number of things that were not lucky on the day,” Weber explained after the race in Austin. Barker finished second. “I’m exhausted from being back in school teaching. That’s not an excuse…it just didn’t come together for me today. I was less nervous than I was last year. I felt good, excited to race, but my body just didn’t really cooperate…My legs didn’t feel great warming up. And usually that happens to me and then they come around in the race; they never really came around today,” Barker said. After the race Weber acknowledged the talent in the field, especially in the women she races against every weekend during the cyclocross season in Colorado. That includes not only Barker, but third place on the day Kristal Boni (Rapid Racing). Fast starters. 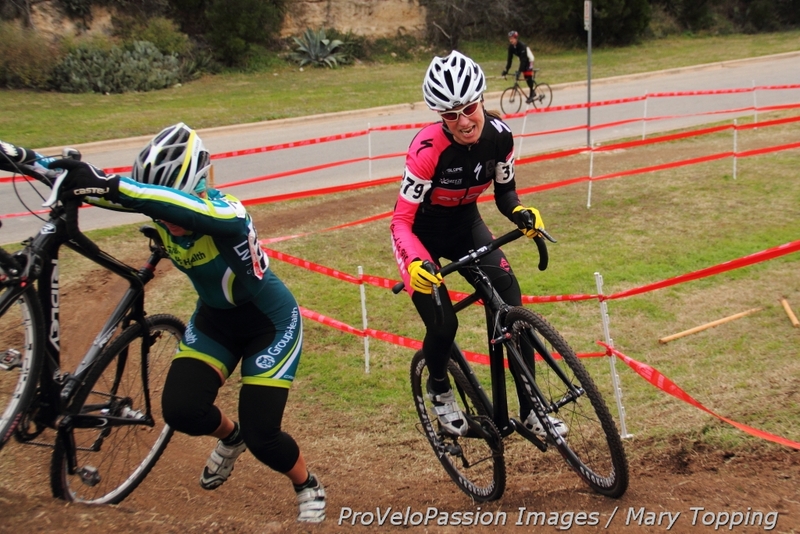 Melissa Barker, right, takes the hole shot in Austin at ‘cross nationals.